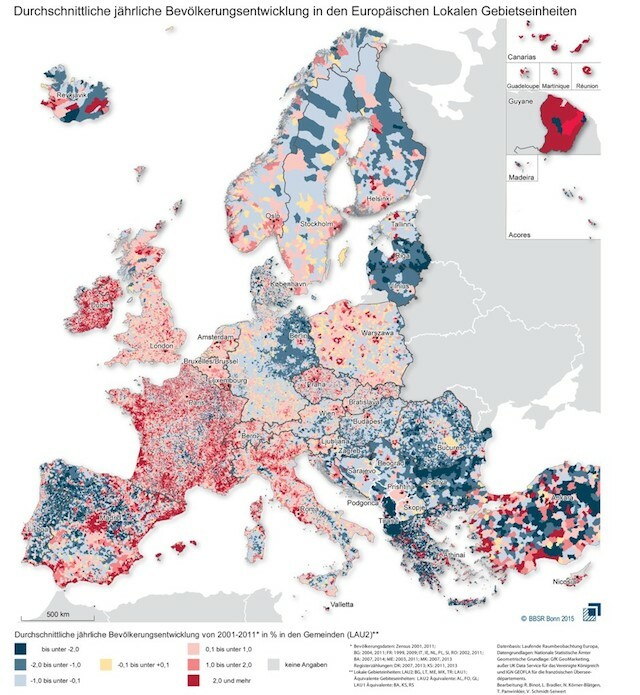 This map details how the population of every municipality in Europe changed in the first decade of the new millennium. It was created by Germany’s BBSR, the country’s Federal Institute for Research on Building, Urban Affairs and Spatial Development using stats from 2001-2011, the most recent years for which comprehensive population data is available for all of Europe. Although it's incredibly detailed, the map is relatively easy to understand. The different colors represent average annual population change for each municipality over the ten years studied. Blue means the population shrank, red means the population grew, and beige represents no significant change either way. The shades allow for a more specific reading: Dark blue patches mean an average annual population decline of 2 percent or more, medium blue patches mean a decline of between 1 and 2 percent, and the lightest blue patches mean decline of up to 1 percent. It works in reverse with the red: deep red means an average annual population growth of 2 percent or more, medium red means growth of between 1 and 2 percent, and the pale pink areas mean growth of up to 1 percent. Over at The Atlantic's City Lab, they noticed a few trends across the continent as a whole. Those rings of red around Eastern European cities represent the increasing suburbanization that is finally happening in once-Communist countries. Second is the migration away from the East—especially Albania, Bulgaria, and Latvia—in search of jobs. Meanwhile, the Northwest region of Europe is growing, on the Scandinavian Arctic Coasts and the United Kingdom. The Northeast has shrunk, and the Mediterranean coast has experienced a boom as older Europeans retire to warmer weather.